- Unfortunately, the evil reflection of Lake Hylia is largely sealed from the outside world from Lorule. The best way to access it at this point is to look for a crack in Hyrule. Search the eastern end of Hyrule, near the Hyrule Hotfoot game, and you'll find a sizeable crack in the wall through which you can access Lorule. You can also get into it by searching the waters that empty into Lake Hylia from the north; there's a crack in the shallows to the east of the bridge that leads out of the rock field, and beside the bridge (while you're here) is a Maiamai in the water. This next section, however, begins with the eastern entrance. - You can proceed straight to the dungeon if you want, but, hey. There are things to look at here first. Start with the obvious blocked cave near the crack between worlds. Blow it open to find a fairy fountain with three Fairies. - Right of the crack is a ladder leading to a ledge. Climb and merge with the cliff wall, then travel west. At the end of this track is a skull. Bust it open to find a Maiamai. - Travel south along the shoreline. Where the path turns west you'll find a Maiamai stuck to the cliff wall. - Hop in the water and head northwest. You'll see a large turtle imploring you to find and help its babies; we'll get back to her in a moment. - Swim to the far shore to find the Lakeside Item Seller's house. He sells the usual assortment of Bees, Golden Bees, Fairies and Shields. He's mainly worth visiting for his weird, backward reference to A Link to the Past... and because there's a Maiamai clinging to the cliffs south of his house. - North of his house, by the chasm, is a chest containing 100 rupees. - Last, you can find a Maiamai in the waters to the east of the obvious dungeon in the area. It's sitting underwater, near some similarly-submerged rupees. - Now for Mama Turtle's request. Start by merging with the wall northeast of the shop. 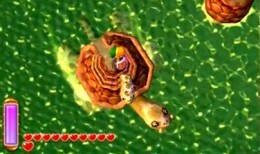 You'll find a turtle to pry free about halfway along; do so by turning back into normal ol' Link. - Jump back into the water near the item shop. A turtle is being harassed by fire-spitting water-dwellers. Kill them to set it free. - Climb onto Mama Turtle's back. Not only will you now be able to grab the items atop the platforms in the lake as she circles, you'll have easy access to the dungeon in the north. Hop off, use your Ice Rod to turn the flaming eruption near the entrance into a block you can temporarily merge with, and go inside. - You'll come out in a large central room, which, you may notice, is shaped like a turtle. Clever. Start by stepping onto the lever north of the door. It will tip depending on which side you're on. Stand on the left side, then freeze it with the Ice Rod. You can then run up the ramp and onto the catwalk nearby. Merge with the wall and follow it to the southeast door. - Freeze the lever to the south and use it to get up to the catwalks. Freeze the fireball that erupts beside the central platform to access said platform. Use the Ice Rod to activate the four switch orbs here and a chest containing the Compass will appear. - Freeze the two fireballs that erupt to your left. Use them to move north, over a lever and onto a sort of contained catwalk. It ends with a button that opens a door to the north. If you backtrack south and merge with the wall you can also find a button over the southwestern door which opens it up; inside you'll find a lever that lead to two teleporters. One will take you through a normal chamber and into a third chamber, filled with lava, that you can bypass via the Ice Rod to reach a Heart Piece. The other leads to a Small Key. - Before going through, use the lever in the east to get up to the eastern wall. Merge with it and travel north. You'll find a Small Key hanging out over the northeast doorway. Remain merged and keep going north to find a doorway leading to a chest with 50 rupees inside. 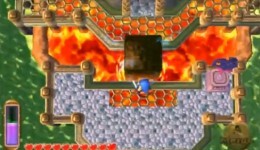 Go south and you'll find a transporter which will lead you into a room with three fire-breathing creatures on the opposite side; kill them with a ranged weapon to unlock a chest containing 50 rupees. - Drop down and go through the northern door. Inside you'll be attacked, first by a wizard on the ground, then by two more on the walkways above. Attack the first with your sword and take out the other two with the Ice Rod. Go down the stairs at the end. - Central room, bottom level. Start by hitting the switch beside the door to move the platform above you into place. - There are three more wizards on the northern end of this room. Two of them you can kill with the Ice Rod; the third you can get with thrown Bombs. Go up the lever in the west and you can find a fourth wizard to kill. Get all four to unlock a hidden giant chest nearby. You can't get at it yet, though. - Enter the northwest door in this area. Inside are four flaming gargoyle statues that will come to life and attack you. You must freeze them with the Ice Rod and then swipe with your sword to do damage; otherwise you'll just get hurt. Killing them unlocks a teleport spot that will take you out of the dungeon. - In the northeast of the central chamber is a small room with a green, laser-toting statue. Beside it is a Small Key. Snag it and run back out. - Use the western levers to access the southwestern door. Inside, past some lava traps, is a button. Step on it to create a path leading east. - Use said path to reach a switch. Before using it, enter the southeastern room nearby and hit the button inside. It will create a new path in the south of the central room. - Go back out and stand on the gold plate to the left of the switch and hit to to create a path back north. Run across before time runs out. - Return to the western levers and cross the first one. Use the Ice Rod on the eruptions to your left to get to the wall. Merge with the wall and travel north, to a locked door. Inside is the big chest with, you guessed it, the Big Key. - Leave this room and merge with the wall again to knock down a metal walkway leading to the big chest you revealed earlier. Inside is a Hylian Shield. - Return to the southern end with all your equipment in hand. 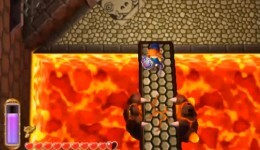 Go through the door revealed by hitting a button earlier to find two platforms, a switch, and a lot of lava. Hit the switch with a ranged weapon (the Ice Rod is implied, but I find Bombs easier) and the platforms will start to rise up and down. Merge with the wall at the top of one of these ascensions to get at the big door. - Go through and up to the raised platform in the north. Two more wizards will appear. Kill 'em to reveal the path to the boss of Turtle Rock. Another blast from the past, though Trinexx fights somewhat differently from before. This battle begins on a vast expanse of magma, and Trinexx swims in it, appearing as a roaming volcano. Avoid the eruptions, including those from Trinexx's back, and wait for it to move beneath a gap in the floor. Once it does, use the Ice Rod to pelt it from above. Continue doing this until Trinexx changes tactics. The gaps in the floor will close, and Trinexx leaps up onto the platform. Now it will roam around, trying to snap at you with its vicious beak and surprisingly long neck. You can use your sword here, but I find hitting it with the Ice Rod from a distance quite easy as well. Be wary if Trinexx leaps into its shell, as it's about to unleash an area explosion that will do damage if you're caught in the flames. Back off and wait for it to reemerge. Once Trinexx begins flashing red it will add one more attack to its repertoire: it will retreat into its shell and try to spin into you, bouncing off of walls. This is an easy enough attack to avoid. Aside from that, the battle carries on as before. Keep swiping and casting and Trinexx will die soon enough. After Trinexx goes down you'll receive your regular Heart Container, always good, and you'll save Sage Impa from her imprisonment. Only two left now!